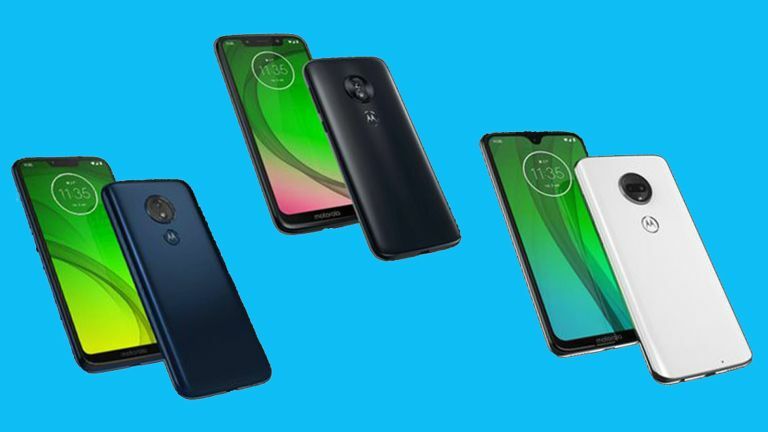 The entire range of the Motorola Moto G7 has leaked revealing everything we can expect to see from the Moto G7, G7 Plus, G7 Power and G7 Play and it looks like the Moto G6 is about to get a serious upgrade. While there is a lot of excitement around the rumoured Motorola Razr V4 foldable phone, the G7 is also due to impress those on a budget. Now a new leak, via CNET, appears to have revealed the entire Moto G7 line-up along with specs – all found on the official Motorola web store in Brazil. While the G series is a budget line-up it looks like Motorola is going to offer even more bang for your buck in 2019. Across the line-up are slim bezel screens, rear placed fingerprint readers, Android Pie OS and trusty headphone ports. The Moto G7 and G7 Plus feature 6.24-inch displays with 403ppi thanks to a 2,270 x 1,080 resolution. The G7 Play gets a 5.7-inch 294ppi, 1,512 x 720 display while the G7 Power will have a 6.2-inch 271ppi, 1,520 x 720 resolution screen. All three of the latter handsets will get a 1.8GHz Snapdragon 632 CPU and 8MP f/2.2 snapper, while the Moto G7 Plus gets a 1.8GHz Snapdragon 636 processor and 12MP f/2.0 shooter. The Moto G7 Power will get a hefty 5,000mAh battery while the other three run a 3,000mAh unit. The RAM varies with the G7 and G7 Plus getting 4GB (these are the only two with enough power for facial recognition) while the G7 Play has just 2GB and the G7 Power has 3GB. You can expect to hear all this officially, along with pricing, very soon: the launch is set for February 7.